WHERE: CALarts Severance (Tower District) 1401 N. Wishon Ave.
It’s time for Prom with NOCO! Come dressed in your best prom outfit (past, present, or make-believe) or high school cliché (jock, cheerleader, emo: think GLEE for inspiration) and get entered into a free raffle to win a special aerial class card! Use your imagination and creativity!!! 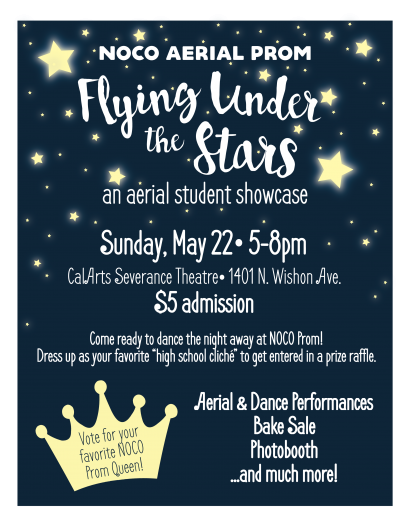 Upon entering the event, you will receive a ballot to vote for your favorite performing aerial student to become this year’s NoCo Prom Queen 2016! 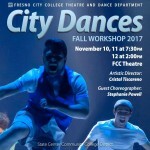 Many of the aerialists who train with the NOCO AERIAL ARTS PROGRAM are showcasing their skills in hopes to win a class card for our upcoming aerial semesters as well. 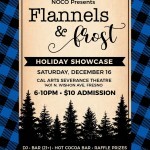 • items range from $1-5, all proceeds go to the NOCO AERIAL ARTS PROGRAM! • grab a cup of delicious punch! • don’t forget to capture your experience under the stars at our Photobooth! • go request your favorite track and hit the floor! • don’t be a loser! you can’t be caught in the quad NOT rocking your NOCO wear, make sure to buy a tee or hoodie! • dressing up for the event gets you entered into the raffle, but you can buy $2 raffle tickets also! Don’t miss your chance on winning an aerial class prize! 5pm: Doors open! Dance floor open! ~ You have the first hour to arrive, find a seat, and than get yourself on the dance floor! This may be a student showcase, but it’s still PROM! ~ This will be where all of our prom queen nominees will show you what they got on their favorite aerial apparatus! ~ At this time the performances will be done. All ballots will be due and we will award our raffle winner while the votes for our new queen are counted. ~ Once the queen is announced everybody in attendance will be asked to find a partner and come to the dance floor. As our new Prom Queen performs, we will slow dance around her in her honor. ~ Its the last 30 minutes of prom! You better shake what your mama gave you and steal a kiss! Make this year’s prom a night to remember!